Cologne, 12 June 2018 – The concept of achieving a complete, high-density fiber management infrastructure may seem like a daunting task for many operators, however Michael Zammit, VP and GM of Go!Foton Corporation, global leaders in innovative fiber connectivity solutions, believes that it is imperative to start off on the right foot and future-proof your network now, to avoid headache and heartache in the future. “Operators must evolve their network to be smarter and more efficient at the outset, and this starts by building a “Layer 0” fiber infrastructure that is both versatile and agile enough to manage the explosive growth in optical port connection density, while synonymously being ready to support any new technologies and applications which may emerge down the road. Future-proofing your connectivity infrastructure in this fashion can be done in a way that is both practical and budget friendly for the service provider, while enhancing the ability to manage new services without compromising network performance and reliability,” explained Zammit. Building the best network, the right way, is somewhat of a grey area in the industry. Often companies implement stopgap measures to fix issues of the present because on the surface, it may be seen as the instant, lower-cost option. Rather than investing in quality pieces of infrastructure which ensure continued operation and system longevity, organizations remain in a state of disrepair, continually only fixing what is technically broken, as opposed to planning for the future. Similarly, many of the new solutions on the market today claim to address certain connectivity challenges, however only introduce new problems for the operator. “The benefits of starting off on the right foot are unlimited, and if operators don’t take these steps now, challenges and issues that they are currently facing will be magnified down the road as fiber counts and connection density continues to grow exponentially. Not only does this ultimately impact their ability to provide quality services to customers, it affects growth and the ability to be future-ready and support emerging trends and technologies,” added Zammit. Go!Foton’s answer to an all-encompassing fiber management solution is the PEACOC high-density fiber management platform. 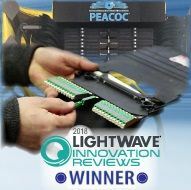 PEACOC (Platform with Enhanced Access for Compact Optical Connectors) which will be on display at ANGA COM this year, is a high-density fiber management platform which provides operators not only with piece of mind, but with a unique and adaptive design, that allows technicians to manage and operate their networks with greater ease, accuracy, and reliability. The highly versatile PEACOC HD platform also enables service providers, and their respective data centers, to operate more efficiently and therefore cost-effectively to better manage the increasing strain on OPEX. “A major issue we are seeing at this time is the inability of existing infrastructure to keep up with increasingly higher fiber count cables and the strain it puts on managing higher density fiber connections. The era of 5G, C-RAN hub densification, network virtualization and IoT, are things organizations need to be able to cater for, and innovative technology like the PEACOC HD platform plays a crucial role in allowing service providers to manage these services in a way that maintains the highest network quality and reliability. If you don’t take appropriate measures now, it will only compound the debilitating issues that are already impacting an operator’s ability to grow and succeed,” concluded Zammit. The PEACOC HD fiber management platform, alongside a complete range of the company’s optical connectivity solutions will be on display at booth 7 / B83 at ANGA COM 2018 held at the Koelnmesse, Cologne, June 12-14. Go!Foton (www.GoFoton.com) provides a variety of innovative telecom and data center solutions for long haul, metro, and broadband access applications, as well as supplying optical materials and components to the imaging, medical, and instrumentation markets. A global company, Go!Foton has sales offices in the U.S., Europe, and Japan, in addition to R&D and manufacturing facilities in the U.S., Japan, China and in the Philippines.